Country Garden House is between Betws-y-Coed and Capel Garmon in Conwy. Our holiday home is set in a peaceful and rural area. 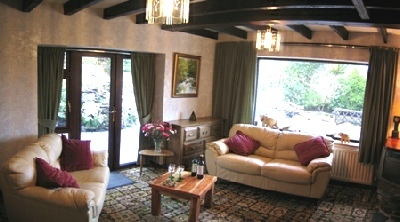 It is well placed for those who want to explore the Snowdonia National Park and the coastal haunts of North Wales. Our holiday home is the self contained wing of our Swiss, chalet style house. It can accommodate up to four adults, when using the lounge as a second bedroom. Capel Garmon is a pretty Welsh village in Snowdonia. It is high above the Conwy Valley and a peaceful place to visit. Many of our guests like to wander off into the surrounding woodlands and about the hillside from where the views are even better. Not surprisingly, there you will find more wooden benches where you can take a break and enjoy the splendid views.